Nature’s Guardian is useful if you anticipate dropping to low levels of health on a frequent basis. Frozen Power is the least potentially useful of the three talents in this tier, only effective on a single target. Earthgrab Totem is an AoE root/slow. Call of the Elements is the most useful choice of this tier. Totemic Projection is useful for movement heavy fights, not much else. Totem Restoration is unimpressive at this time. Elemental Mastery is my recommended choice, offering the greatest DPS increase. Ancestral Swiftness is an instant cast spell every minute plus a passive haste buff, not bad. Echo of the Elements has a chance to duplicate spells that deal direct damage or healing. Healing Tide Totem is an effective raid healing tool. Ancestral Guidance is similar in effectiveness only it depends on your damage dealt and is thus best paired with other effects/cooldowns that boost your damage output. Conductivity is only useful for situations where the raid and enemies stack up in a single position. All three talents are a decent DPS increase with Elemental Blast being the optimal choice. Glyph of Thunderstorm – Important glyph to keep your tank from being annoyed with you. Maintain Flame Shock on your target at all times for both the guaranteed Lava Burst critical and the chance for Lava Surge to proc. Cast Lava Burst as often as possible, including after Lava Surge procs. Use Earth Shock when you have more than 5 charges of Lightning Shield. Cast Lightning Bolt when none of the above are available. When facing multiple targets maintain Flame Shock on all of them and begin using Chain Lightning instead of Lightning Bolt while otherwise maintaining your single target rotation. Begin using Magma Totem if facing 3 or more enemies. Simply spam Chain Lightning when facing larger groups of 4 or more targets as well as cast Thunderstorm and Earthquake on cooldown. Fire Elemental Totem should be used as often as possible assuming that the elemental will actually be able to effectively attack the boss for the full duration of the ability. The Glyph reduces the cooldown and uptime of the elemental by 40%. Earth Elemental Totem should also be used on cooldown. Thunderstorm is an effective AoE tool and a method of regaining mana. Spiritwalker’s Grace should be activated whenever movement is required during an encounter. Elemental Mastery provides a 30% haste for 20 seconds and should be used on cooldown. Ancestral Swiftness allows for an instant cast spell every minute and should be used as often as possible. Both Healing Tide Totem and Ancestral Guidance are healing cooldowns and should be used when your raid needs them. Int is solidly better than the other stats, but it isn’t wildly better. In addition, gems with secondary stats have twice the value of gems with primary stats, so your Haste gems are 320 points and your Int gems are 160. For this reason you should match socket bonuses, though we recommend only doing it if it’s for a nice Int or nicer Haste bonus. Keep in mind that Spirit from gear = Hit and you will want to keep an eye on your total Spell Hit. Slot appropriately. If you find yourself short of the cash needed to buy expensive gems then you should see this post. Your Mail Specialization adds to any Int gem, Enchant, or Profession bonuses, making them worth 5% more Int. That bonus does not add to other stats, such as Haste. Mists of Pandaria enchants: Note that these are somewhat better than earlier enchants. Go here to learn how to make more gold so you actually can afford to buy all of your gems, enchants, pets, mounts, gear, dates, guild events, donations, vanity items, etc. Head enchants are gone in MoP. Shoulder enchants come from Inscriptionists. As prime bolt lobber and general Elemental Engine of Destruction your race doesn’t matter all that much. If being big and furry or short and annoying is more important than every last iota of DPS then go for it. Can choose to be either Horse or Alliance upon leaving their starting area. Take less falling damage, though this has little PvE use. Jewelcrafting skill increase: JC has some nice self-only gems. This will get you into those gems that much sooner. Health Increase is good in all cases, but is actually kind of puny at high level. Good with Herbalism, and this skill provides a Haste buff. Berkserk increases casting speed, once every three minutes, which can be rather nice. Regeneration Increase isn’t big enough to care much about, especially since you can heal. Increased Alchemy skillis nice if you have that skill. Keeping a pile of mana potions on your bar is a good idea anyway. PvE Choice? Orc or Troll, since you can pick the timing of your abilities for greatest effect. Draenei, followed by Goblins, for their passive haste increases. The best way to get to the level cap fast is to do it with an in-game Shaman leveling guide. If it shows you where to go, when to go there, and what to do every step of the way, such that you don’t have to look anything up then your leveling is going to be really fast. 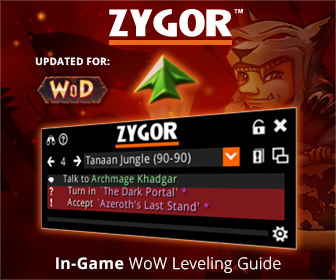 Zygor’s Guide is our choice to fit this bill and can get you to the level cap faster than you might think possible, assuming you stay out of the RPing, fussing around, PvP ganking, and endless shopping. Zygor’s shows up as a small window in your main game screen and it not only tracks everything that you need to do, but it displays an arrow that points your way to the next task. You’ll never have any doubt as to where to go or what to do, regardless of what level you happen to be. Leave the game and come back and the guide will remember where you left off. Gain a bunch of levels in PvP and/or the dungeons and Zygor still has your back. It will detect your new level, adjust appropriately, and let you delete your old quests. Zygor’s is always quickly updated for the latest patches and expansions, and this includes its nifty Talent Advisor tool. Go here to snag your copy of Zygor’s Guide now (or read our review) and get leveled fast.